This shower curtain is designed and produced by well-known German brand Kleine Wolke, established in 1968, and is backed by their quality guarantee. No liner necessary. Quick-dry and easy-care polyester fabric, durable and long wearing. Blue: Blue on a solid white background. The beach seashells are 2 to 3 inches in height. In addition there are light blue wavy lines across the width of the curtain. Beige: Subtle redish brown tone on a very light solid beige background. The beach seashells are 2 to 3 inches in height. In addition there are medium tone beige wavy lines across the width of the curtain. 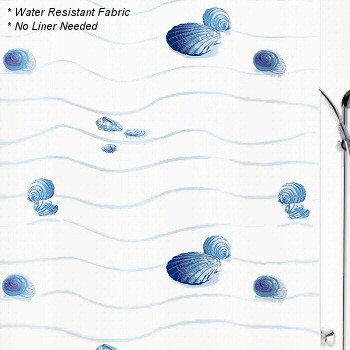 The Miami non toxic fabric shower curtain is available in standard tub width - 12 eyelets.